NOTE: Outdated info! See my Christmas Party guide above. 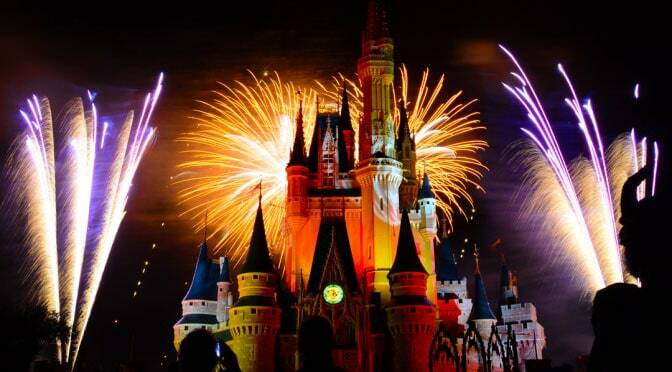 NOTE: The Castle Dream Lighting show takes place every night from November 9 through New Year. I’ve placed the shows in the order of the times they appear to make it easier for you to make your schedule. We usually visit Animal Kingdom during the day, leave about 1:00 pm and take a nap. We arrive at the Magic Kingdom around 6:00 pm to avoid the crowds and stake out our first character meets. I find the second parade much easier to find a good spot, but it’s also quite late for some children who haven’t taken that nap I mentioned. The best location to view the parade is either near the Hall of Presidents or in the Castle Hub. It’s because the floats make a big turn in those locations, causing them to slow down. I prefer to watch fireworks on Main St very near the tip board by Casey’s Corner. If meeting the 7 Dwarves (photo only, no autographs), Jack Sparrow or Rapunzel is important to your family, be sure to get in line early. People begin lining up at 6:00 pm and characters don’t begin meets until 7:00 pm. The line for the Dwarves, Jack Sparrow and Rapunzel with Flynn were all quite long in 2011. Jack’s line did let up some by 11:00 pm, but the Dwarves and Rapunzel didn’t. Santa meets at the Flag Pole next to City Hall and attracts quite a crowd of families posing for their Christmas card photos. There is a backdrop with Santa, so you don’t get a photo of the castle behind him. Don’t be late for the Castle Lighting. It’s a short show, but quite impressive to watch the castle go from dark to brightly lit with more than 250,000 twinkling ligths. The parade is fun as it includes dancing reindeer, gingerbread and a visit from Santa! The firework show is festive Disney Christmas at its best. People tend to leave the Christmas parties even earlier then the Halloween Parties and lines for many characters lessen after the fireworks.